The all-new Dreams Playa Mujeres Golf & Spa Resort is set along a private stretch of beach in a serene gated community, only 10 miles north of downtown Cancun. Enjoy 65,000 sq. 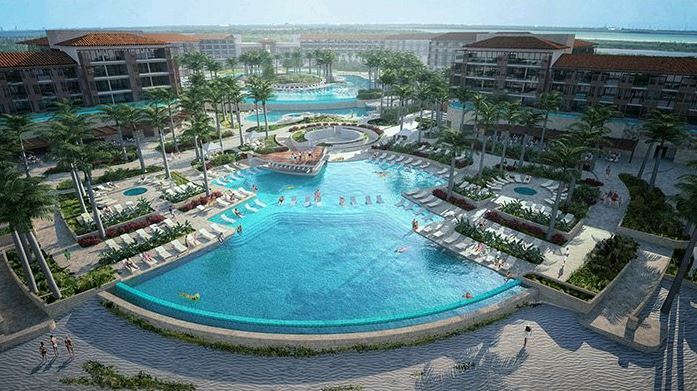 ft. of swimming pools, a water park on-site and complimentary greens fees at the Playa Mujeres Golf Course next door. Find a vacation beyond your wildest Dreams and enjoy Unlimited-Luxury®—where everything is included. Please be advised there is a 3 night minimum stay required. Room, Meals, Beverages(including alcohol), Taxes, and Tips. We strongly recommend travel protection when booking a trip. Visit our Travel Protection page for more information. We can also help you book your airfare for this trip. Shared roundtrip airport transfers are available from CUN for an additional $44.00 per person. Cancellation policy: Initial Deposit is non-refundable and non-transferable. After final payment date, trip is 100% non-refundable. The Options Travel Protection Plan includes a CANCEL FOR ANY REASON coverage only when purchased within 14 days of initial deposit. Cancel for any reason covers up to 75% of your non refundable costs if cancelled prior to 3 days of your departure date and time. Terms and Conditions do apply. Please click here to obtain your state-specific Certificate Of Insurance that contains the complete terms, conditions, limitations and exclusions of the Certificate. If travel protection is selected your policy will be issued based on your total trip cost per person and any cost adjustment will be reflected on your registration. Please be advised that travel protection must be paid in full at time of booking in order to issue your policy.